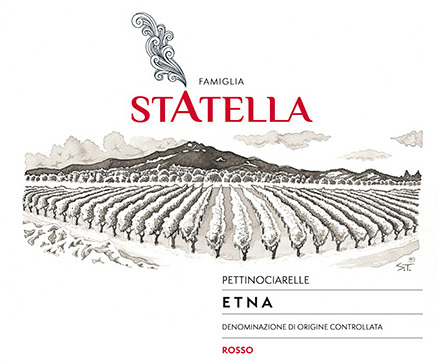 Navigate: Main Directory / All Wines (alphabetically) / Famiglia Statella 2016 Etna Rosso "Pettinociarelle"
This wine is a blend of Sicily's indigenous grapes - Nerello Mascalese and Nerello Cappuccio (90%/10%), grown in one of Etna's typically volcanic vineyards at an altitude of 837 feet. Fermentation/maceration lasted 10-15 days before aging for 10 months in 2nd- & 3rd-use French oak tonneaux (550 L = 145 Gals or just over 60 full cases) before bottling. A total of 400 cases produced. This is the Statella's first release. Delicious now, will be even better after 2020, likely peaking around 2025. Ian D’Agata (Vinous): "Bright red-ruby. Very aromatic nose of sweet spices and riper red cherry, with flashes of raspberry liqueur and strawberry jam thrown in for good measure. Enters round, luscious and with outstanding inner-mouth perfume, then risingly tannic on the classically dry, mouthcoating finish. Improves markedly in the glass, showcasing a combination of minerals and of red fruit cocktail. Aged roughly ten months in used oak tonneaux, this ought to age well. From a fifteen year-old vineyard of roughly 90% Nerello Mascalese and 10% Nerello Cappuccio in the Solicchiata area. ...Outstanding first time wine from Calogero Statella, technical director at Tenuta delle Terre Nere. A star is born! 93 pts"
Calogero and his wife, Rita, were both born and raised in the shadow of Mt. Etna, growing up in the land of lava ash and black soils. Calogera Statella has crafted the wines for Tenuta delle Terre Nere since 2003, helping to establish their fame as one of Etna's premier producers but their dream has always been to purchase their own family vineyard and produce wine under their own label. They purchased the vineyard in 2015 and the dream became a reality - and it's a true family affair - the Statella's manage every stage of bringing this wine to life. This wine was raised at the Tenuta delle Terre Nere facility, an arrangement that will likely continue until and if the Statella's open their own facility.